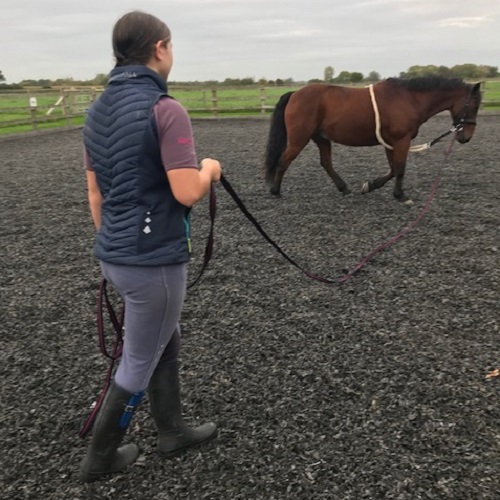 At the time of finishing my last blog we were very hopeful of a couple of positive months with my pony Pepsi before winter set in…Well things haven’t been quite so straightforward! But then again when are they ever, when horses are involved? You may remember that we had to move yards back in February. Sadly the yard that we moved to was also going through some unexpected changes and we found out we needed to move again before the winter! We moved again at the beginning of September and I’m pleased to say Pepsi and I couldn’t be happier where we are. Pepsi is very settled now and has made lots of buddies as well as starting a new game in the field called ‘catch me if you can’! Pepsi and I qualified for the Sunshine Tour championships at Hickstead for the second year in a row. But sadly we never made it to Hickstead this year. In fact we haven’t been able to compete at all! During a routine vaccination appointment with my vet, she discovered that Pepsi was showing signs of mild lameness. I had known that Pepsi did not feel quite right but like many things, it was very difficult to pinpoint where and what the problem might have been. You may remember that we had been taking things easy after Pepsi had shown signs of stiffness in his back earlier in the year. We decided that we would try and get to the bottom of the what was causing the problems and we took Pepsi to our vets for a lameness work up and X-rays. As this first investigation was a little inconclusive so Pepsi was referred for a bone scan. This involved leaving him at an equine hospital for three nights — the longest three days and nights of my life! I felt totally lost not being able to see him. After the bone scan Pepsi was mildly radioactive for 48 hours and was therefore in isolation. Thank goodness the scan results were fairly positive. His joints and spine looked healthy! The results were discussed with my vet and we returned for more investigations. Throughout the time spent investigating, my vet advised to keep Pepsi in light work. Each week we hacked lightly and continued our long and low lunge work. As you can imagine, having moved yards a couple of times and now all the visits to the vets, I began to believe that this year really wasn’t going to plan. All I wanted was for Pepsi to be back to his cheeky self. A week before we returned to our vets, I increased Pepsi’s workload and he started to feel much better. Then, after much discussion and a few more X-rays, we believe he has had a soft tissue injury under his spine. This could have been caused by a strain during work or out in the field. The rest, together with the light work, has clearly helped him to recover without any need for any medication. My vet advised me to go and do a few small jumps on a good surface to see how he felt. So this is exactly what we did and wow, what a difference! Pepsi definitely felt happy to be out there again. We are now working a weekly routine of lunging, trotting poles, hacking (when daylight allows) and light schooling. 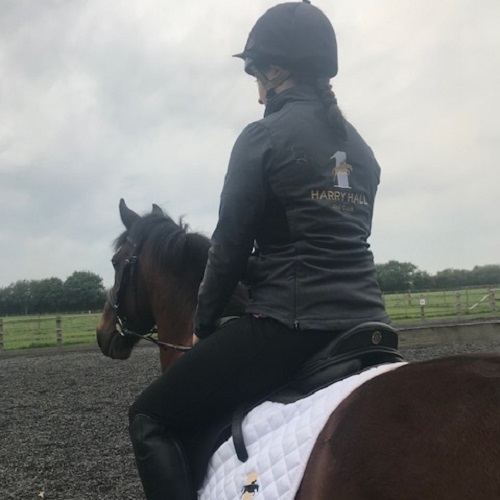 We will be taking it easy over the next few months introducing some dressage competitions to start with and then moving on to small show jumping classes. The main focus of working Pepsi at the moment is to continue to build up his fitness and muscles without straining anything. The last few months have taught me so much! Life with Pepsi keeps me grounded and the bond between us is stronger than ever. As I am now in my GCSE year at school I will be juggling school work and time with Pepsi, but as this is now our third winter together we know what to expect and are ready to tackle it head on. The biggest lesson I have learned this year is that you just don’t know what is round the corner. Having the security of the public liability and personal accident insurance benefits with the Harry Hall One Club means Pepsi and I can go and enjoy what we do knowing we are protected if the worst happens. Have you joined yet? 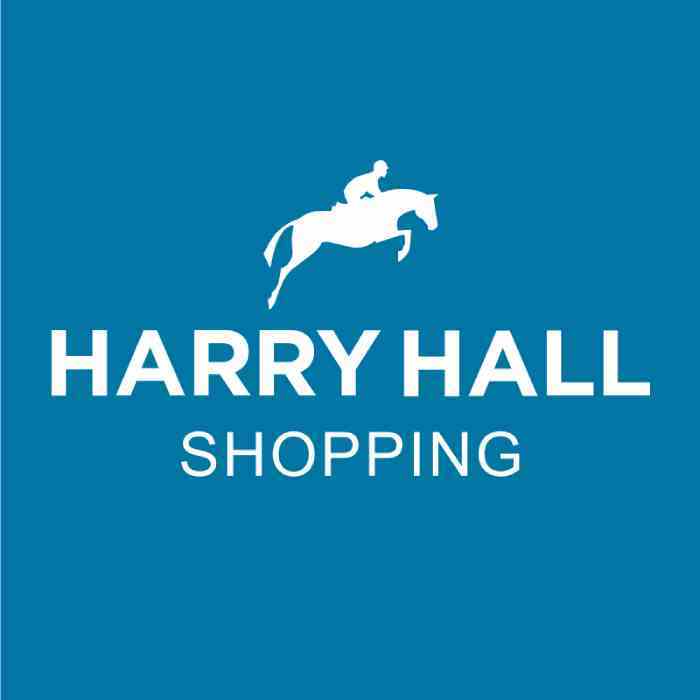 There are so many benefits and there are some amazing bargains to be had and free gifts just for joining — take a look on the Harry Hall website. The cold days and nights are here so I have been wearing my cosy Beeford Jods and stylish Hartfield Gilet together with my Edlington boots. They are the best way to keep warm and look stylish. Finally I must mention the amazing Protechmasta dog coat. Mygolden retriever suffers with so much stress during the firework season. Thankfully this year we have been using the coat and the difference in her behaviour is quite outstanding. She started fretting when hearing the fireworks, but once we put it on, she calmed and eventually lay sleeping. I can highly recommend this product!